Chia seed oil content includes information on calories, fats, vitamins, minerals and protein. Chia, known since ancient times as an excellent source of energy, contains a variety of healthful properties. Many people prefer to take chia oil capsules as an easier way to incorporate this wonderful vegetarian source of omega-3 fatty acids into their diet. The ancient Aztecs carried chia seeds with them when they marched off to war. Ancient peoples loved chia seeds, for the seeds sated their hunger and stored well without going rancid. Today, chia continues to gain popularity as more and more people discover its unique health benefits. The fiber contained in raw chia seeds slows digestion and the release of glucose into the bloodstream, helping diabetics maintain appropriate blood sugar levels. Fiber also creates a feeling of fullness, the dieter's best friend, leading to weight loss claims for chia seeds. But it is the heart-healthy benefits of chia seed oil that make chia one of the most popular supplements on the market today. Whether you prefer chia capsules or bulk chia oil, you'll want to know the chia seed oil content and nutritional information. Brands may vary in their nutritional analysis, but all contain most of the following components as outlined in the nutritional analysis below. A scientific paper, outlining the full chemical analysis of chia seed oil content may be found at the Nutritional Science Research Institute. Chia seeds contain an abundance of protein, vitamins and minerals. The seeds provide an excellent source of plant-based protein, including many amino acids needed by the body. Chia provides calcium, phosphorous, zinc, copper and manganese too. Full nutritional data on chia seeds may be found at Nutrition Data. According to some manufacturers' websites, the only difference between chia seeds and chia seed oil is that the oils lack the natural fiber found in the seeds. Compared to many other sources of omega-3 fatty acids, chia seeds oil is comprised of two-thirds omega-3 fatty acids. These acids, and the ratio or balance of various types of omega fatty acids, may reduce inflammation and heart disease. Compared to other plant-based sources of these healthful fats such as flax seeds, chia contains more per serving.Chia seed oil contains mostly polyunsaturated fats, with a small measure of mono-saturated and saturated fats. Polyunsaturated fats and mono-saturated fats are considered the best types of fats to consume to boost overall good health, and especially cardiovascular health. Chia seed oil contains no cholesterol. The supplements also are salt-free. If you're watching your cholesterol or sodium intake, you can safely take chia seed oil supplements. Each brand varies in nutritional information. Here are three common brands available online, and the contents of each supplement. Puritan's Pride 1000 mg Chia Seed Oil Capsules: Each capsule contains 1,000 mg of chia seed oil, with 630 mg of alpha linoleic acid (omega-3), 210 mg of linoleic acid (omega-6), and 72 mg of oleic acid (omega-9). Salba White Chia Seed Oil: Salba white chia seed oil capsules contain 710 mg of total fats. 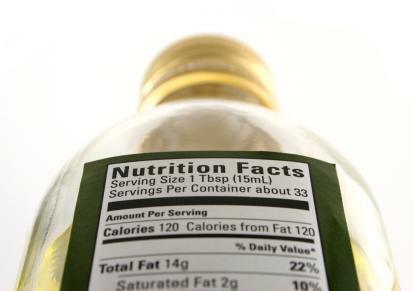 Of those total fats, 380 mg are omega-3 fatty acids, 186 mg are omega-6 acids, and 44 mg are omega-9 fatty acids. As you can see from these two brands, most chia seed oil products contain an abundance of omega-3 acids, some omega-6 acids, and a small percentage of omega-9 acids. Many health researchers and scientists consider this ratio the optimal ratio of omega acids for human health and wellness. Research on chia seeds and chia seed oil supports many of the theories around its health benefits. Some brands purport to be superior to other brands with claims of higher amounts of omega-3 fatty acids in their chia seed oils. Always review the label information carefully on supplements to make sure the manufactures aren't stretching their claims too much. Ask yourself, "What scientific research proves their point? How do I know their claims are justified?" You may decide that the benefits of the so-called superior chia seed oil does not outweigh the extra cost. Chia seed oil provides excellent benefits and appears to have few side effects. While eating chia seeds may provide more fiber, chia seed oil provides the same heart-healthy oils as the seeds, but in a more convenient form.